Rany on the Royals: Top Moments (#35 - #31) of the 2014-2015 Kansas City Royals. Summary: Mike Moustakas ties Game 2 of the 2015 ALCS in the 7th inning with a single off of the player who was selected ahead of him in the 2007 draft. This team is harder to kill than that Brotherhood Without Banners dude in Westeros. I thought I had covered all the possible storylines and narratives that the 2014-2015 Royals have run roughshod over, but it turns out I missed one: the narrative of How Could The Royals Let David Price Slip Through Their Hands. You might not remember this narrative, but I do, because I practically invented it. To briefly review: in 2006, Dayton Moore’s first year as general manager, the Royals were the worst team in baseball. With three games left in the season, they had already lost 100 games. The Tampa Bay Devil Rays were 61-98, but unless the Rays got swept in their final series of the season against Cleveland and the Royals swept their final opponent, the Detroit Tigers, the Royals would finish the season with the worst record in the major leagues. And that’s exactly what happened. The shock isn’t that the Devil Rays got swept; the shock is that the Royals swept the Tigers. Shocking, because this was the season the Tigers completed the greatest three-year turnaround in baseball history – after setting an American League record with 119 losses in 2003, the Tigers were the toast of baseball in 2006, starting the season 76-36. They then sort of collapsed down the stretch, and came into the final series of the year tied for first place in the AL Central after leading the division by ten games in early August. But still: they were 95-64. The Royals were 59-100. Shocking, because going into the final series, the Tigers had beaten the Royals 14 times in 15 games. Shocking, because the series was in Detroit. And it’s not like the Tigers had nothing to play for – the division was up for grabs. Somehow, and in characteristic “the Royals can’t even win for losing” fashion, the Royals swept the Tigers. On Friday, they trailed 5-2 after six innings, then scored single runs in the 7th, 8th, and 9th and tied the game when John Buck (!) and pinch-hitter Shane Costa (!!) singled with two outs in the 9th. The Royals then hit three homers in the 11th (!!!) and withstood a two-run comeback from the Tigers in the bottom of the inning. On Saturday, the Royals scored seven runs in the top of the 1st (!!!! ), and won, 9-6. On Sunday, the Royals trailed 7-4 going to the 8th inning, but scored four runs on a rally the 2014-2015 Royals could admire: a hit batter, a walk, two singles, an error by third baseman Brandon Inge, a walk, and a single. In the bottom of the 8th, Matt Stairs – who the Royals had traded away earlier in the year – tried to do his old team a favor by homering to tie the game. In the bottom of the 11th, the Tigers loaded the bases with one out, but Inge struck out swinging and then Jimmy Gobble (I’m running out of exclamation marks!!!!!) came in to retire Curtis Granderson. The Royals scored two in the 12th and held on for the win. It was one of the most dramatic, random, and completely counterproductive sweeps in the history of baseball. Why do I say that? Why am I telling you about a series that happened to a last-place Royals team a decade ago? Because by sweeping the Tigers that weekend, the Royals finished with a better record than the Tampa Bay Devil Rays, which meant that instead of getting the #1 pick in the 2007 draft, they had to settle for the #2 pick. If they had lost any of those three games, they would have drafted first overall. And it was clear – even in September, nine months before the draft – who that first pick would be: David Price. The story had a happy ending for Tampa Bay. Price made his pro debut in 2008, the year they changed their name to the Rays, and the year they changed their fortunes from hapless losers to the best dollar-for-dollar team in the game. Price ripped through three minor league levels and was promoted in September, not making his major league debut until September 14th, but he was Brandon Finnegan before Brandon Finnegan was – moved to the bullpen for the playoffs, Price saved the Rays’ hides in the ALCS against Boston. This is largely forgotten now, but the Rays were up 3 games to 1 in the series and had a 7-0 lead in the middle of the 7th inning in Game 5 – and the Red Sox scored four in the 7th, three in the 8th to tie, and walked it off in the bottom of the 9th, a miracle that would impress even the 2014-2015 Royals. The Red Sox then won Game 6. In Game 7, the Rays led 3-1 after seven innings, but an error, a single, and a walk loaded the bases with two outs before Joe Maddon turned in desperation to Price – his fifth pitcher of the inning – to face J.D. Drew. Price struck Drew out, and pitched a scoreless 9th inning to send Tampa Bay to the World Series. Even then, I wrote about what a break the Rays had gotten when the Royals swept the Tigers two years before. That would have been enough, but then David Price turned into one of the best pitchers in baseball. He made four All-Star Games as a member of the Rays, won a Cy Young Award, and was a Cy Young runner-up. The story had a happy ending for Detroit as well. Despite somehow losing out on the division and the #1 seed in the playoffs, the Tigers still qualified for the postseason as the wild card team, back before there was a play-in game. Detroit then won seven straight games to win the AL pennant – Minnesota lost in the first round – before being upset in five games in the World Series. And then, eight years later, they acquired Price from Tampa Bay. Price was his typically excellent self as a member of the Tigers, and in his one playoff start in 2014 allowed two runs in eight innings, although he got saddled with the loss anyway. And when they fell out of the race in 2015, the Tigers cashed Price in and got three prospects, including Daniel Norris, in return. But, incredibly, the story had a happy ending for the Royals as well. Mike Moustakas turned into a top prospect, and then he turned into a promising major league, if not a star like Price was. And then he was pretty terrible for two seasons, and in 2013 you could argue that had the Royals drafted Price (who in an off-year still had 2.8 bWAR) instead of Moustakas (who had -0.1 bWAR), they might have bridged the five-game gap between them and the playoffs. But in 2014, the Royals made it to the playoffs despite a terrible year from Moustakas. They almost certainly would have won the division with Price instead of Moustakas – particularly since the Tigers wouldn’t have been able to acquire him – but then they wouldn’t have won the Wild Card Game, which set them on an emotional trajectory all the way to the World Series, and they wouldn’t have benefitted from Moustakas’ five home runs in the playoffs. And in 2015, Moustakas became the player the Royals thought he could be. He still wasn’t quite as good as Price during the regular season (Price had 6.0 bWAR to Moustakas’ 4.4), but he was plenty good enough for the Royals to finish with the best record in the AL. And in Game 2 of the ALCS, after David Price had utterly dominated the Royals for six innings, they had scored two runs and had the tying run on second base with one out when Moustakas stepped into the batter’s box. And on a 2-2 pitch, finally vindicating what happened nearly a decade earlier, Moustakas lined Price’s changeup over Ryan Goins’ head for a base hit. Eric Hosmer didn’t hesitate and took off for third base on contact, but he was barely at third base when Jose Bautista fielded the ball. Of all the decisions Mike Jirschele has made at third base the last two postseasons, this is the only one I really question – he sent Hosmer with one out, when a halfway decent throw gets him at the plate. In fact, as off-line as Bautista’s throw was, had his throw been six inches closer, or had Russell Martin shuffled his feet over a bit more and grabbed the ball on the bounce, Martin would have had a good chance to get Hosmer with the swipe tag before Hosmer crossed the plate. I understand that the Royals wanted to push the envelope against Bautista’s defense, but with only one out I don’t think the risk was worth it. But it worked out perfectly. Not only did Hosmer score, but Moustakas took second base on the throw home, setting up the next Moment on our list. I guess the only team that the David Price Story didn’t have a happy ending for was the Blue Jays; they lost all three playoff games that Price started for them. We’ll save Moustakas’ at-bat against him in Game 6 for a little later. Oh, and if the Royals had drafted Price? He would have walked away as a free agent this winter. Moustakas, on the other hand, is a Royal for at least two more years. I didn’t see a way for the Royals to win the exchange back in 2007. I certainly didn’t see a way for them to win the exchange in 2013. But then the Royals have spent the last two years proving that they’ll find a way to win even when one doesn’t exist. Summary: Alex Gordon follows with a two-out double to drive in the go-ahead run and chase David Price from the game. After Mike Moustakas tied Game 2 with his single, Salvador Perez struck out looking on a very questionable full-count pitch, bringing Alex Gordon to the plate with two outs. As with Moustakas, the count ran to 2-and-2, and then Gordon fouled off a pitch, and then he took a changeup down, fouled off another pitch, and finally lined a 95 mph fastball into the right-center field gap, easily scoring Moustakas with the go-ahead run, and chasing David Price – who had entered the inning having retired 18 of 19 batters and having thrown just 66 pitches – from the game. Three lefties had faced Price in the inning: Eric Hosmer had singled on a changeup, Moustakas had singled on a changeup, and Gordon had taken a two-strike changeup before hitting a fastball for a double. After the series ended, Tom Verducci revealed that Price had been subtly telegraphing his changeup – taking an extra breath between pitches before throwing one – that the Royals’ advance scouting had picked up on. This is perhaps the best testament you can make to Dayton Moore: that he not only built a championship roster, but that he’s built a championship organization. When it comes to advance scouting, or coaching (think Rusty Kuntz), or even windmilling (think Mike Jirschele), the Royals take a back seat to no one. A lot of times that stuff doesn’t matter. And sometimes that stuff directly leads to the most pivotal inning of the ALCS. 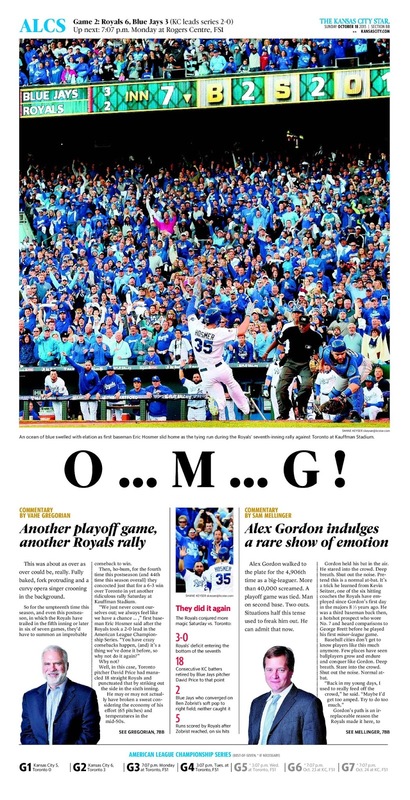 Summary: With the Royals down 2-0 in Game 7 of the World Series, Alex Gordon brings the Royals back with an RBI double in the 2nd before scoring the tying run. Even with 24 outs to go, the temptation was there to panic, because we knew Madison He-Who-Shall-Not-Be-Named was lurking, and if we knew how much and how effective he would pitch we would have panicked even more. But Billy Butler led off the bottom of the 2nd with a single up the middle, and on Tim Hudson’s first pitch, Gordon split the gap in right-center field and the ball rolled all the way to the wall. Even with no outs, Mike Jirschele sent Butler from first on an aggressive send; Jirschele must have gauged the speed of the runner and the vector of the ball perfectly, because Butler was safe by a clear but uncomfortable margin. The Giants’ lead was cut to 2-1, and the tying run was in scoring position with none out. And sure enough, the Royals matched the Giants’ talent for runner advancement, as Gordon would move up to third base on a flyout to left field by Mike Moustakas and score on a lineout to center field by Omar Infante. The score was tied at 2-2, and the Royals had once again stepped back from the precipice of defeat. Unfortunately, the Giants would push them back one more time. Every play in a World Series Game 7 is magnified, and with a WPA of +13%, this was the biggest play of the game for the Royals – even Gordon’s single/error with two outs in the 9th only raised their Win Probability by 11%. And as I detailed in this article, in a Game 7, your WPA is the same as your CPA – Championship Probability Added. This Moment raised the Royals’ odds of winning a world championship by 13%. 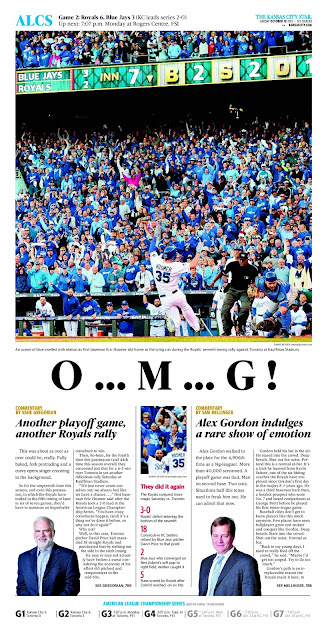 By that measure, it was the Royals’ biggest play of 2014. Summary: Eric Hosmer hits a fly ball deep enough to drive in Alcides Escobar with the winning run for just the fourth walkoff win in Royals postseason history. In 31 postseason games – 22 of them victories – the Royals had only two victories of the walkoff variety. That’s not unusual over the course of a season – if one out of every 11 victories is a walkoff win, that’s seven or eight walkoff wins in a season for an average team – but it’s lower than you’d expect for these Royals given how many of their playoff games were incredibly close or decided late. Put it this way: they scored the winning run in the 9th inning or later five times in nine road playoff victories, but just twice in 13 home playoff wins. As hard as it is to believe, the Moments at the top of this list would have been even more dramatic had, say all of their extra-inning home runs occurred at home. One of their two walkoff wins at home needs no introduction, and will rank as high on this list as you’d think it would. 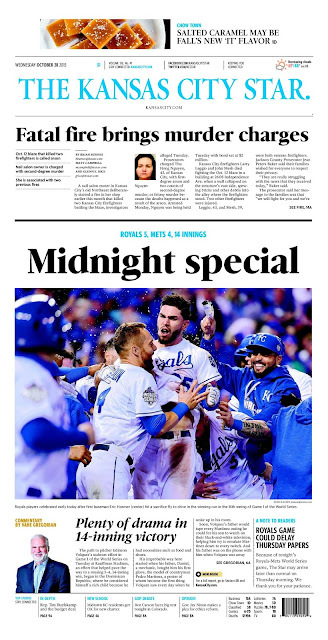 The other one, though – this one – ranks about as low as it’s possible for a walkoff win in the postseason – let alone the World Series – can rank, because when Eric Hosmer batted in the bottom of the 14th inning – after Alcides Escobar had reached base on David Wright’s error (Moment #58), after Ben Zobrist singled him to third base (Moment #45), and after the Mets chose to intentionally walk Lorenzo Cain – the bases were loaded with nobody out. The odds that the Royals would score in the inning were about 88%; the odds that they’d win the game were 94% (factoring in their 50% chance of winning had the game continued to the 15th). So while it wasn’t a foregone conclusion that the game would end right here, it was a pretty good bet – particularly with Bartolo Colon on the mound, not exactly the kind of pitcher who can strike his way out of a bases loaded, no out situation. But Eric Hosmer did his job, and in doing his job he atoned for his 8th-inning error that allowed Juan Lagares to score the go-ahead run with two outs – one of the worst moments for the Royals in the last two years. Colon got two strikes on Hosmer, but – Team Contact! – he could not get the third. Hosmer got a 90 mph fastball over the plate and hit it in the air, exactly what he wanted to do, to medium-depth right field. Frankly, Curtis Granderson – who is not known for having a strong arm at all – made a tremendous play to make this play as close as it was, backing up and getting a running start on his throw so that he could hit the catcher on the fly. But Escobar was just too fast, and the throw wasn’t drop-dead perfect, and – unlike in 2014 – the Royals had won Game 1 of the World Series. Hosmer's double at 35! I thought for sure it would be in the teens. This just highlights how much fun the remaining moments will be for me! Hosmer's double at 35 & Alex's double at 33 seem to low on the list. I'd would had them somewhere in the 15-20 range myself. That being said, it really says something about how many awesome moments there are that we are debating absolutely HUGE moments being ranked in the 30's! Other teams have got to be so jealous. Thanks for pointing out that we had caught on to Price tipping his changeup. I forgot all about that. 2015 marked the first time as a sports fan I really felt like my team was coaching circles around other teams, especially in the postseason. I feel like i have a glimpse into how Patriots fans must feel. And it feels GOOD. Like everyone else, I have been loving these "moments"! (The 2015 Royals: World Series Champs AND they set up a situation where Rany posts EVERY DAY!) But I think the David Price/Moose blurb might be the best piece you have done yet during this series. It really feels like a topic for a long form column. An incredible little read and pure Rany. Thanks so much. Another happy consequence of the Royals drafting Moustakas in 2007 is that having a young up-and-coming third baseman made moving Alex Gordon off the hot corner an option...and his career was turned around by that move to left field. Granted, Butler does not match Gordon in speed, but Butler was already well around 3rd when Crawford prepared to throw from right center after Gordon's double in the 2nd inning. This fact further reveals that Crawford likely nails Gordon in the 9th with any kind of accurate throw. I still say the key to that 9th inning play is Crawford's scoop of the low throw in left center. Any kind of bobble and the game would have been tied. Love this series of highlights. Can't wait for the final week's worth.